and in his later years. It was 27 years ago, on December 15, 1991, when a hero of the Soviet Union passed away at the age of 76. He was Vasily Grigoryevich Zaytsev, the legendary sniper of the Red Army whose name became inextricably linked to the Battle of Stalingrad. He was the man that made the Nazi soldiers tremble in fear. Born in March 1915 in Yeleninskoye, Orenburg Governorate, a member of a peasant family, Vasily learned hunting at a very early age. He became acquainted with marksmanship by his granfather who taught him how to hunt deers, wolves and other animals. At the age of 12, Vasily got his first rifle as a gift. He learned how to be invisible from his target and he was an extraordinary self-controlled young man. The hunting advice from his grandfather was proved very useful some years later. 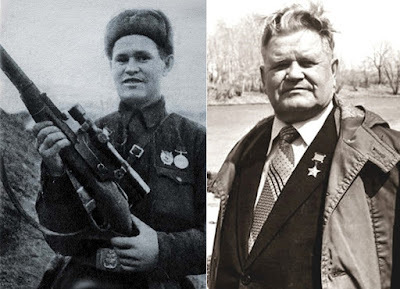 As a child the targets caught in his sniper sight were rabbits and deers - as a soldier of the Soviet army he became a killing machine against the Nazi troops. The outbreak of World War II caught Zaytsev in the finance department of the Soviet fleet in Vladivostok, where he had been serving as a clerk since 1937. But filing papers wasn't enough for the man who was to become a world-known hero of the Red Army. By the Summer of 1942, alongside other soldiers, Vasily had applied five times with the request to be sent to the front. 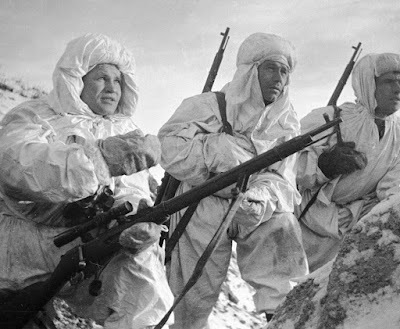 His request was finally approved and he was assigned to the 1047th Rifle Regiment of the 248th Rifle Ddivision which was became of the 62nd Army at Stalingrad on September 1942. There was no land beyond the Volga for Zaytsev and his comrades. He got to the front as a simple soldier, fighting hard against the enemy. Although he was wounded, he never left the ranks. From the beginning of the battle in Stalingrad, he showed his excellent skills as a shooter. Zaytsev could kill an enemy soldier from a distance of 800 meters, just with his simple 3-line M1891 rifle. A month later he was given a medal for his bravery; by that time, Vasily had killed 32 German soldiers with his simple rifle without a sniper sight. Except from the medal, Zaytsev was given a rifle with an optical sight. What followed was extroardinary! Between 10 November and 17 December 1942, Vasily killed 225 Nazi soldiers, including 11 snipers of the German army. His excellent performance in marksmanship inspired his fellow Soviet comrades and spread fear and terror among the Nazis. The overall official number of enemy troops killed by Zaytsev in Stalingrad is 243, although the actual number is probably much higher. Vasily served at Stalingrad until January 1943, when he was seriously injured in the eyes by a mortar attack. However, due to the efforts of ophalmologist Vladimir Filatov, his sight was restored. On February 22, 1943 Zaystev was awarded the title of the Hero of the Soviet Union and he returned to the front, finishing the war at the Seelow Heights battle, with the military rank of captain. The same year he became a member of the Communist Party of the Soviet Union. After the war, Vasily Zaytsev settled in Kiev where he worked in a textile factory, subsquently becoming the factory's director. He wrote books about his experience in the war and was decorated with numerous awards, including the prestigious Order of Lenin. Vasily Grigoryevich Zaytsev died in Kiev on December 15, 1991, just eleven days before the complete victory of the counterrevolution and the dissolution of the Soviet Union.